It’s scheduled to launch in March 2017. There’s of course much more to the Switch than that, but Nintendo isn’t offering a lot of explicit details just yet. Thankfully, the Japanese game company released a trailer to debut Nintendo Switch that tells us a lot more. Here are the coolest things we discovered! Bottom, far right: These are the aforementioned small controllers. These snap onto the sides of the Switch screen, turning it into a portable console. They can also be used individually, or snapped onto a controller at home for a more traditional experience. Nintendo's calling them 'Joy-Con' -- like joystick and controller, all at once. 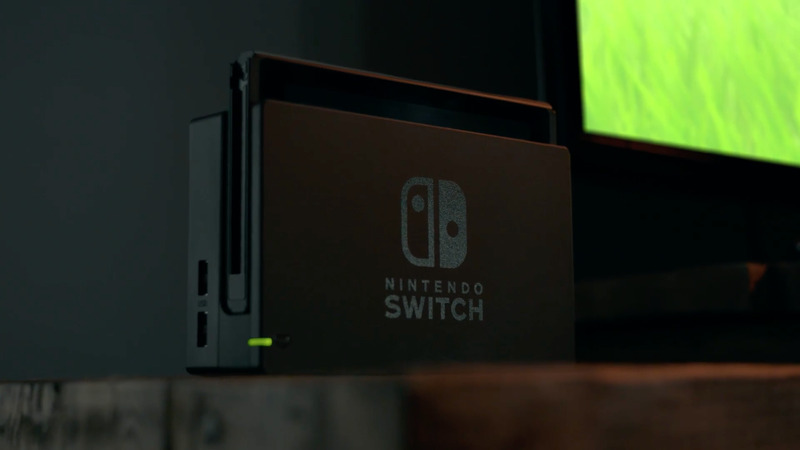 We're betting that what you see above is exactly what'll come in the box when Nintendo Switch arrives in March 2017: the Nintendo Switch Dock, the tablet-like console, and a home gamepad with the detachable Joy-Con in-tow. 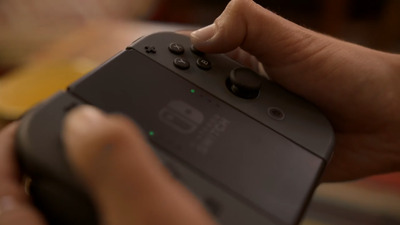 Notably, the controller is actually called the 'Joy-Con Grip' -- since you can detach each side of the Joy-Con bits and attach them to the Switch tablet, the Grip acts as a means of turning the Joy-Con into a more traditional gamepad. The Joy-Con Grip gamepad has two offset analogue sticks, and four buttons on each side. There are also shoulder buttons, and triggers on each side -- the standard gamepad setup nowadays, more or less. 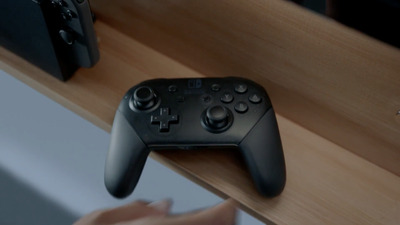 This is the Nintendo Switch Pro Controller. Nintendo's been making the Pro line of gamepads since the original Wii -- a way for people to play Nintendo games with a relatively standard gamepad. The Nintendo Switch is no exception: this generation's iteration of the Pro controller looks an awful lot like an Xbox One gamepad. The thumbsticks are concave and offset, and there are four face buttons on the right side. Don't expect this guy to ship with the Nintendo Switch next March -- it's almost certainly going to be sold separately. 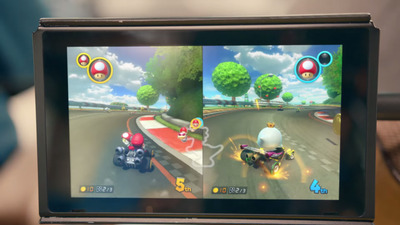 Top, far left: One example Nintendo gives of how the Switch can be used is in the car, on-the-go. In this instance, someone has purchased a Switch mount; then, the Joy-Cons are detached and used as two individual gamepads. If they look tiny, that's because they're hilariously tiny. While it looks like a lot of fun to play a new 'Mario Kart' game in a car, we're betting most folks will either play alone or wait until they get home (where there are normal-sized gamepads). Top, middle: Here's a closer look at the Nintendo Switch Pro Controller. It's a pretty standard gamepad. It's not clear if you can use it without the Nintendo Switch Dock -- could one of the 'Mario Kart' contestants above be using one instead of the tiny gamepads in the example? Perhaps, but who wants to carry a gamepad everywhere? 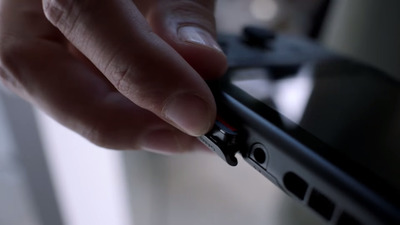 Top, far right: Nintendo smartly built a kickstand into the read of the Switch tablet. 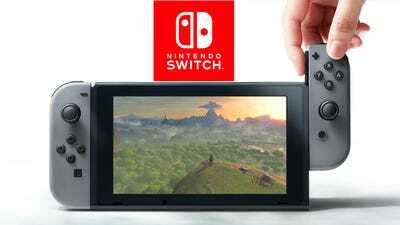 The company envisions this being used for multiplayer gaming and in-flight gameplay -- we envision it as an easy way to watch a movie on the Switch. 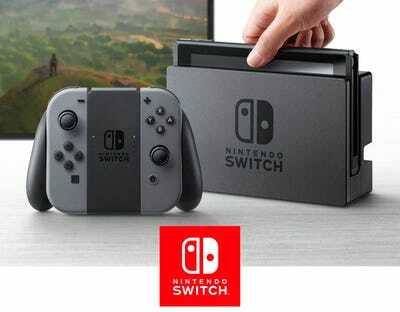 Nintendo hasn't confirmed Switch as a multimedia device, but we'd be shocked if it weren't capable of as much. Bottom, far left: As seen here, the Joy-Con Grip comes together via slidable attachments. Each side of the Joy-Con gets attached to the Grip by sliding it on. We're anxious to see how this works in practice -- the last thing anyone wants is a bunch of hardware rattling around in a bag. Nintendo's only shown one video of the Switch in action. 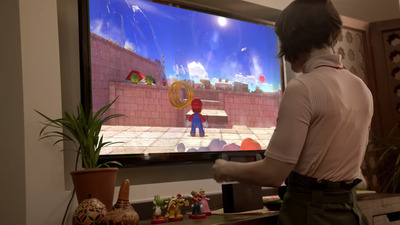 In it, people play a new 3D 'Super Mario' game, a new 'Mario Kart' game, an unnamed basketball game that looks suspiciously like the NBA 2K series, and Bethesda Game Studios' 2011 masterpiece 'The Elder Scrolls V: Skyrim' (a remastered version of 'Skyrim' is launching this year on the PlayStation 4 and Xbox One -- this is very likely that version). You can tell that it isn't 'Mario Kart 8' for Wii U because Boo isn't in that game. Also, there's no item switching in 'MK8.' We're gonna take a wild guess right now that this game is called 'Mario Kart Switch.' $10! Right now! On the table!